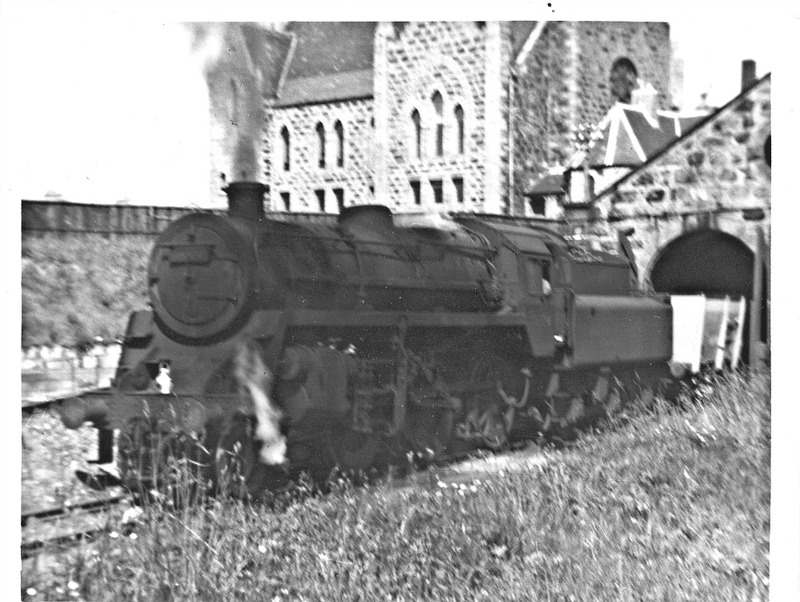 Here are some c. 1961 never-before-published Scottish steam pics. Die-hard steam fans only, please. The rest of you, look away now. On the topic of Scottish steam, I'll be quite candid. Along with anyone else with an interest in Scotland and old locomotives, I've got plenty of 'modern' pictures of the usual suspects. I mean pics of preserved locomotives: the Jacobite steam train on the Mallaig line; the pinewoody views of the Strathspey railway; the fine re-creation of a branch line at Bo'ness - as featured in my main Scottish railway page. And that's all very fine. But pictures of railways from the old days when there was actually were, uhmm, real steam trains in Scotland? Well, that’s different. I haven’t got a lot. I was very young. And I also blame my late father. Just at the time that the 35mm camera was becoming popular, he inexplicably bought a fold-out bellows style 120 format. The lens must have been ground down from the base of an old jam-jar, perhaps. Camera-shake was built in. It was fixed-focus. And the bellows or perhaps the back usually leaked light. It was, in short, not just retro but also all but useless though at least the negative size was bigger than 35mm. However, as a very small but precocious boy, I tried it out, just at the very end of steam in my little home town in the far north-east of Scotland. Below are some of the results. They have never been published before – and you can see why. They’re terrible! Except for a couple of pics taken later, 1965, to be precise, when I had bought a grown-ups 35mm camera. But I still think avid steam enthusiasts will get an impression of what could be seen at one of the branch-line termini of the old Great North of Scotland Railway. In its heyday, this company made at least some of its money through moving fish, as quickly as possible, away from ports such as Fraserburgh, where these pics were mostly taken. Now, lads, (and it will be lads) having shaken everyone off except the die-hard steam fans, let’s get on with it……..
Half a century later, compared to the pic just above. The site of the yard 'throat'. (Pictured here) Half a century later, compared to the pic just above. The site of the yard ‘throat’. (I believe`that's what they call it.) At least the beach and dunes are the same. And the beach at Fraserburgh is one of the finest sandy beaches on the east coast of Scotland, IMHO. Can you believe it, someone just did! Thank you to reader Nick Deacon who informs me that Alexander Reith Gray ‘was a director of the LNER in its later stages before 1948 and also county sheriff of Flintshire’. I appreciate the info very much. The most interesting feature of this period piece above might be in the foreground though. Note the cotton herring-nets drying. The links – the coastal grasslands or common ground – were used for this purpose. Sometimes these drift-nets were laid flat, sometimes draped over wires and fences. At the time, c. 1960(? ), the town of Fraserburgh still had a herring fishery. Scottish steam – half a century after, the only identifiable feature is the former engine shed at Fraserburgh, on the left. (Two pictures here) The then and now picture here shows a surviving railway structure. In the colour pic, that’s the original loco shed on the left. The turntable would have been around the level area, bottom centre (also pictured on this page). The B & W pictures – the shed is just out of shot, left – show some of the 0-6-0 Class J36 that found their way to Fraserburgh. 65227 would have been about where the buff-colored crate is, below the white tank. The station yard, with its fish vans, somewhere beyond the parked cars, has been completely obliterated in the intervening 50 or so years! These J36 locomotives were truly ancient even by 1960, the design itself going back to 1880! One named member of the class – 65222 Somme – wandered to Fraserburgh from time to time, recalling the fact that several of them were shipped to France during World War. Again, it’s the other details that are worth remarking on: note, in both the b & w pics, the lines of ‘blue spot’ fish vans – vacuum-braked (I think) stock used for the fast transport of fish away from the port and off to southern markets. J36 65303 at Fraserburgh, with 2-6-4 Standard tanks also in picture around the turntable. (Of the pictures here) J36 65227 at least has the sun behind me, though the shutter speed was, as ever, shaky. 65303 has the sun behind it – so that was an early morning and I must have cycled down before school. the bunkers of Standard 2-6-4 tanks are also just visible, right, as is the turntable – all long gone. Standard 2-6-0 at Fraserburgh engine shed. (Pictured here) Truly an awful picture! A Standard class 2-6-0 (otherwise unidentified) outside the shed. The J36 pictures above were taken looking down from the sleeper fence behind the loco in this picture. The engine shed itself is the only railway item that survives today, a half-forgotten memory of long-vanished Scottish steam. Next and pictured here, I found a picture or two taken at Ferryhill sheds in Aberdeen (the big city in the south of my childhood, to me, at any rate). It shows, in steam, Class D40 4-4-0 ‘Gordon Highlander’; in the fancified green paint job it received after it was withdrawn and preserved after a lifetime wheezing up and down rural branch lines in North-East Scotland. You can see it today, not at the new Museum of Transport in Glasgow, but in the Scottish Railway Exhibition at Bo’ness. Preserved GNSR loco ‘Gordon Highlander, Class D40, in steam at Ferryhill depot, Aberdeen. And a footnote for the real aficionados – is that not the front end of a ‘Lizzie’ next to it on the left? The Princess Royal class were scarce visitors to this side of the country. Probably on ‘the postal’ if I recall. In fact, I think it was 46201 Princess Elizabeth, coincidentally also preserved. Stanier Black 5 44997 at Ferryhill Shed. What a differnce a proper camera made back in the 1960s. J38 65914, based at Thornton Junction shed, possibly on its last visit to Inverurie loco works, photographed on an autum Sunday as I crept about, heart-in-mouth, looking for steam engines. There were next to none. J38 at Inverurie Loco Works, autumn 1965, almost in the last days of Scottish steam. And that’s quite enough Scottish steam for the moment. I mean, what will people think…….? Mind you, in those days, there were an awful lot of trainspotters – and even anoraks were novel. More Steam Train Tours on that link. More steam train picture in preservation and much much later (mostly at Bo’ness) on the link below. Note to self – must scan some more old stuff! Steam trains in Scotland are easy to find. There are several preserved railways here where you can get a fix of that scent of steam, hot oil & coal dust.